The Ninth Judicial District Commission on Judicial Performance unanimously recommends by a vote of 10-0 that Judge Paul H. Metzger BE RETAINED. 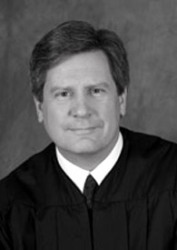 Judge Metzger received a Bachelor of Science in Political Science from the University of Colorado, Boulder in 1978. He received his law degree from Denver University College of Law in 1981. Judge Metzger was appointed as Garfield County Court Judge sitting in Glenwood Springs in 2002 and continues to hold this position. Prior to his appointment to the bench, he was a Deputy District Attorney for the 4th Judicial District in El Paso County. Judge Metzger then worked in private practice in Glenwood Springs. His community activities include working with Youth Zone, a local program working with troubled youth, and school activities such as Mock Trials. He has received an award from Youth Zone. Attorneys and non-attorneys rated Judge Metzger’s judicial performance above average. Both groups commented that he listens, is fair, patient and calm, polite, considerate, respectful, professional, dedicated, reasonable, courteous and knowledgeable of the law. Some in the survey criticized him for a slight bias for the prosecution. Members of the Commission found his written opinions carefully thought out and clear. All agreed he is a valued and valuable representative of the judiciary.